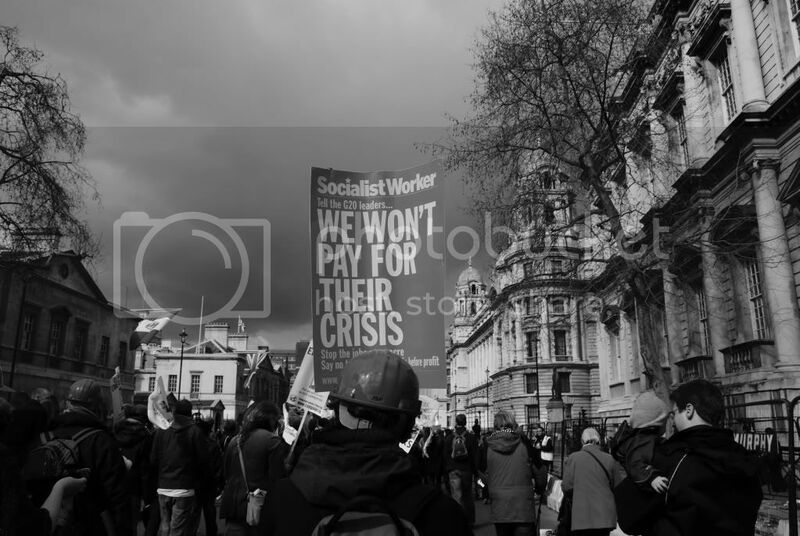 On 28 March 2009 an estimated 35 thousand people marched through London in a rally preceding the April 2 meeting of G20 leaders in London. The purpose of the demonstration was to urge G20 leaders to "put people first." The march started on Victoria Embankment and moved past Trafalgar Square and Green Park to Hyde Park, where there was mass rally. Lenin of Lenin's Tomb once again provided one of the most satisfying "there live" reports of a major demonstration in London. Observe how -- in the tradition of the best there-live blogging -- Lenin consistently uses new media to tell a story. G20 Voice, an organization set up to coordinate the attendance of 50 bloggers at the actual 2 April G20 summit, coordinated orchestrated interviews and community photo-blogging. The rally's organizers, Put People First, set up a website to encouraged people to tweet reports from the rally. They describe it as "an ambitious plan to provide live coverage of the Put People First march and rally from loads of ordinary Twitter users." I don't see it mentioned in the (copious) media reports, but there was one hitch in that the police massively over-reacted to some sit-down protest staged by a small number of anarchists and decided to stop the greater part of the protest from marching on to Hyde Park. The front part of the protest had been at the park listening to speeches for well over an hour before the rest arrived. Curiously, they do mention that 200 "anarchists" who wanted to attend were "kept separate" from the protest by the police. I didn't see anything like that, and it would be a disgrace if it were true. All of this would seem to be part of the continued effort to demonise the protests against the G20 on April 1st and 2nd.